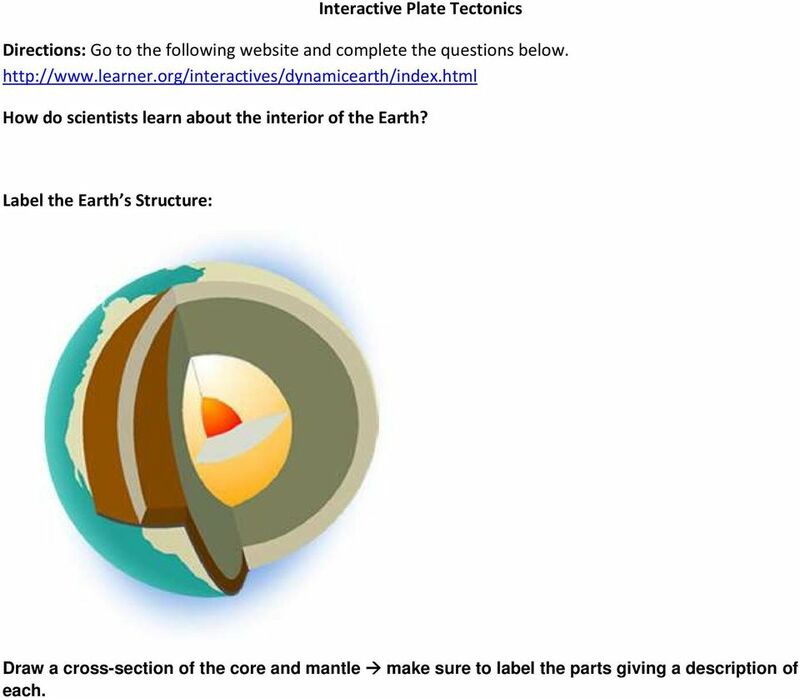 1 Interactive Plate Tectonics Directions: Go to the following website and complete the questions below. How do scientists learn about the interior of the Earth? Label the Earth s Structure: Draw a cross-section of the core and mantle make sure to label the parts giving a description of each. 2 In the early 1900s, the German scientist noticed that the coastlines of and looked like they might together. He also discovered evidence that the same and fossils were found along the coasts of these continents, although they were now separated by vast oceans. In addition, he noticed that formations, like mountain ranges, on the two continents also matched up. He called the original landmass (or supercontinent) "," the Greek word for "all the earth." Over time "Pangaea" split apart and the different landmasses, or continents, drifted to their current locations Continental Drift Fill in the timeline of continents on the move: 200 million years ago 135 million years ago 65 million years ago million years ago The modern theory, which has become widely accepted since the 1960s, states that the earth's outer layer, or lithosphere, is broken into several large slabs called. These plates, which hold the continents and oceans, are but constantly around the planet. The movement of the plates not only supports our understanding that continents are not fixed and moved over time, but also how and why,, and other geologic events occur. 3 Plates & Boundaries As you can see, some of the plates contain continents and others are mostly under the ocean. The of that lies the is called continental crust (granite), while the type found the is called oceanic crust (basalt). Continental crust is thicker about 20 to 40 miles (35 to 70 km) thick and usually older than oceanic crust, which is only 4 to 6 miles (7 to 10 km) thick. All the plates have names, usually referring to landmasses, oceans, or regions of the globe where they are located. Plate Boundaries Map The border between two tectonic plates is called a. All the tectonic plates are constantly moving very slowly around the planet, but in many different directions. Some are moving toward each other, some are moving apart, and some are sliding past each other. 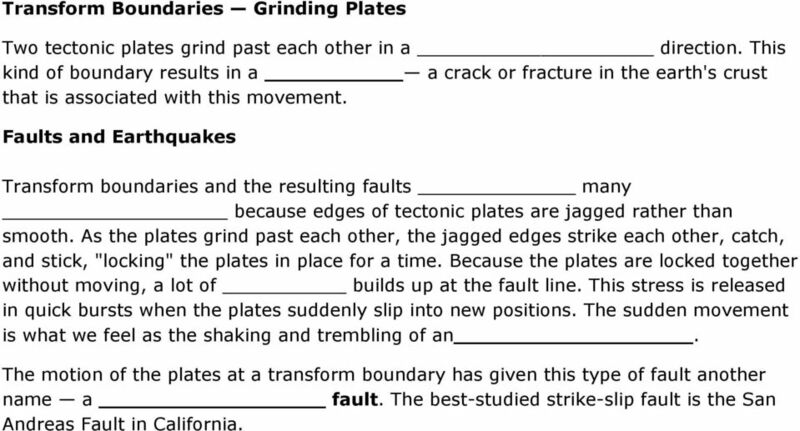 Because of these differences, tectonic plate boundaries are grouped into main types. 4 Complete the chart below on the different boundary types. 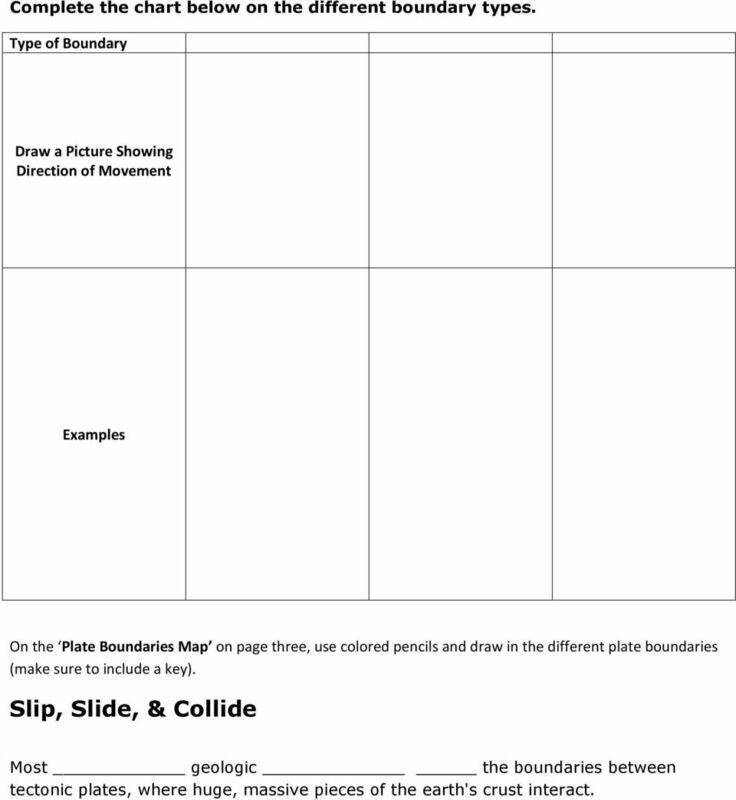 Type of Boundary Draw a Picture Showing Direction of Movement Examples On the Plate Boundaries Map on page three, use colored pencils and draw in the different plate boundaries (make sure to include a key). Slip, Slide, & Collide Most geologic the boundaries between tectonic plates, where huge, massive pieces of the earth's crust interact. 6 The formed at a subduction zone up toward the earth's surface and builds up in magma chambers, where it feeds and creates volcanoes on the overriding plate. When this magma finds its way to the surface through a vent in the crust, the volcano erupts, expelling lava and ash. An example of this is the band of active volcanoes that encircle the Pacific Ocean, often referred to as the of. 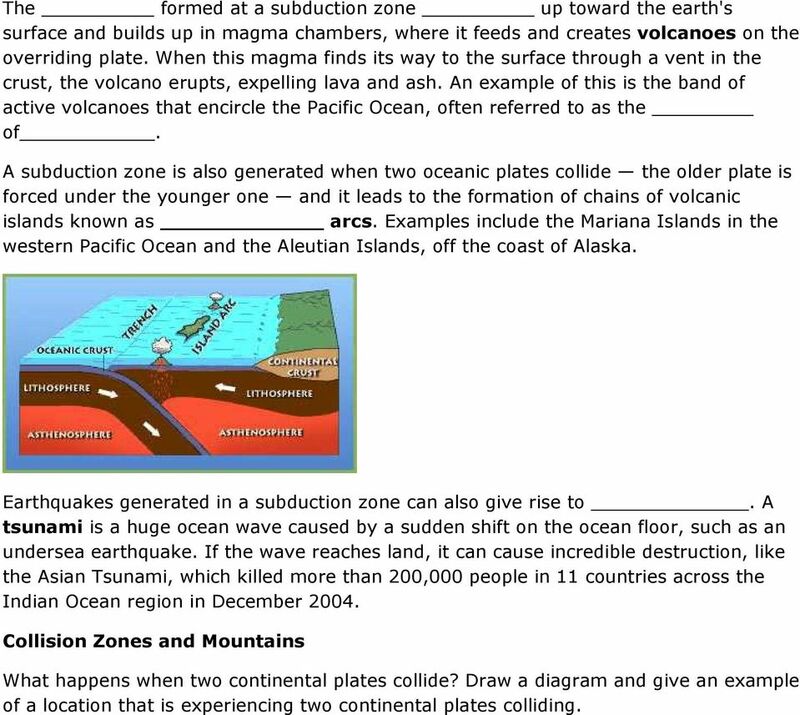 A subduction zone is also generated when two oceanic plates collide the older plate is forced under the younger one and it leads to the formation of chains of volcanic islands known as arcs. Examples include the Mariana Islands in the western Pacific Ocean and the Aleutian Islands, off the coast of Alaska. Earthquakes generated in a subduction zone can also give rise to. A tsunami is a huge ocean wave caused by a sudden shift on the ocean floor, such as an undersea earthquake. If the wave reaches land, it can cause incredible destruction, like the Asian Tsunami, which killed more than 200,000 people in 11 countries across the Indian Ocean region in December Collision Zones and Mountains What happens when two continental plates collide? 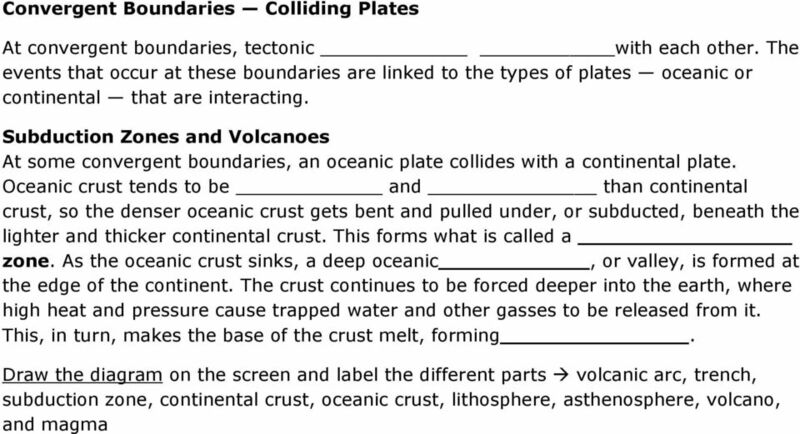 Draw a diagram and give an example of a location that is experiencing two continental plates colliding. 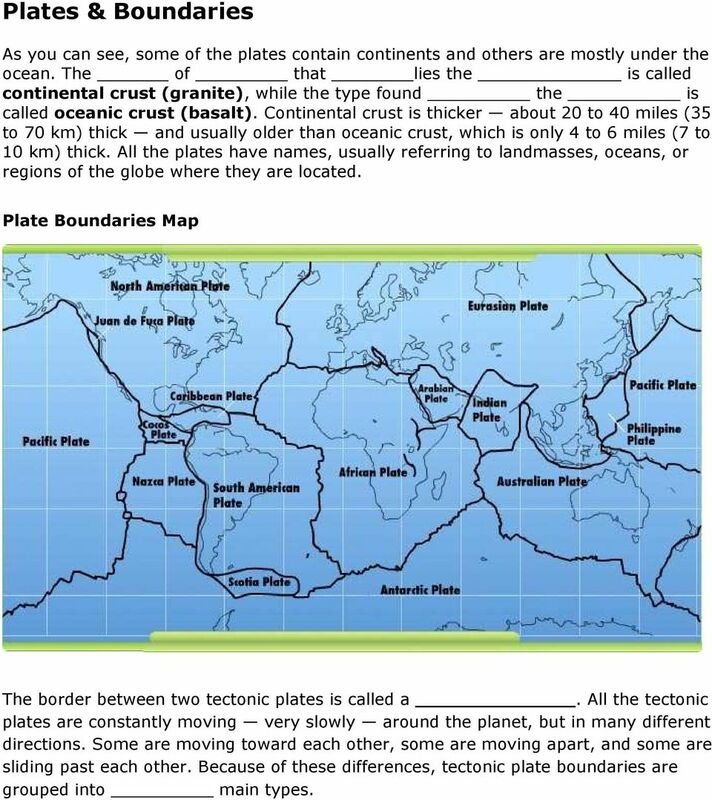 7 Divergent Boundaries Spreading Plates At divergent boundaries, tectonic plates are moving from each other. Seafloor Spreading Divergent boundaries in the middle of the ocean contribute to seafloor spreading. As plates made of oceanic crust pull apart, a crack in the ocean floor appears. Magma then oozes up from the mantle to fill in the space between the plates, forming a raised ridge called a mid-ocean ridge. The magma also spreads outward, forming new ocean floor and new oceanic crust. As the seafloor spreads apart explain how a rift is formed and what features are associated with it. Make a diagram to help with your explanation. 8 Transform Boundaries Grinding Plates Two tectonic plates grind past each other in a direction. This kind of boundary results in a a crack or fracture in the earth's crust that is associated with this movement. Faults and Earthquakes Transform boundaries and the resulting faults many because edges of tectonic plates are jagged rather than smooth. As the plates grind past each other, the jagged edges strike each other, catch, and stick, "locking" the plates in place for a time. Because the plates are locked together without moving, a lot of builds up at the fault line. This stress is released in quick bursts when the plates suddenly slip into new positions. The sudden movement is what we feel as the shaking and trembling of an. The motion of the plates at a transform boundary has given this type of fault another name a fault. The best-studied strike-slip fault is the San Andreas Fault in California.